The single-seater Polaris should have released first. When Polaris released the original Ace back in 2014, they were looking to capture a larger portion of the entry-level ATV market. Its caged, sit-in design, mellow 32hp, 320cc engine, well matched chassis and suspension made it a fun easy going machine with enough power to get around the trail. In 2015, Polaris released the 45hp ACE 570 with a notable increase in torque and engine performance. Its motor was a step forward for the machine, but the added power made it easier to push its ATV-oriented suspension design to the limits. 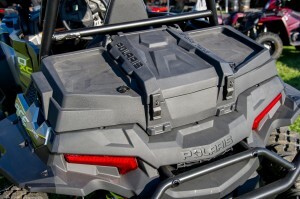 In 2016, Polaris added the 60hp Ace 900 to the line. While its engine was fun on smooth sections of trail, the narrow 48in width and limited suspension held its performance back on rough trails. 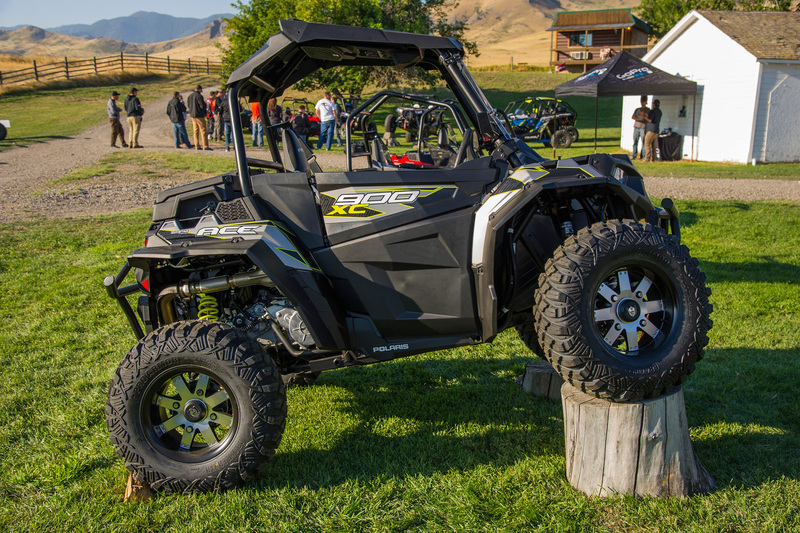 For 2017, Polaris is throwing down their fourth Ace, the 78hp, wide-track, much better suspended Ace 900 XC. 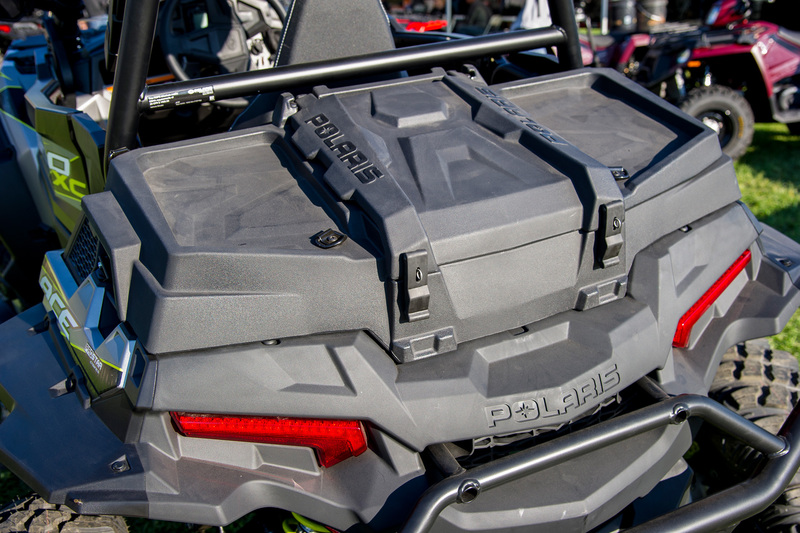 For 2017, Polaris is throwing down their fourth Ace, the 78hp, wide-track, much better suspended Ace 900 XC. 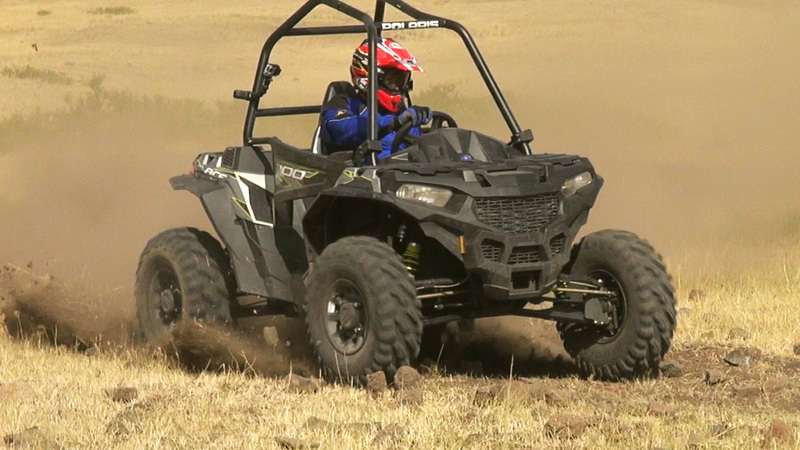 Based on the internet’s skeptical reaction to the original Ace back in 2014 and the number of viewers asking us to review the new 900 XC, this car has the UTV world and us expecting a winner. To find out, we eagerly traveled to Polaris 2017 Press Intro in Montana to take it for a spin. With a large number of publications on hand and the XC 900s in short supply, we teamed up with another publication to get a full hour of seat time in the car to gain a brief first impression. The 900 XC that was available for still images was already outfitted with a number of Polaris accessories including a winch, front and rear bumpers, a roof, windshield, storage boxes in the bed and in dash compartments, door extensions, rearview mirrors, and a Pro Armor tire and wheel package. This machine looked Moab ready though the stock machine is pretty well appointed. 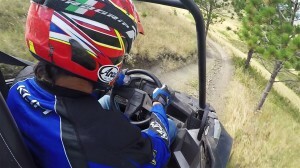 The guys from GoPro Camera were on hand showing how their cameras integrate with Polaris’ new Ride Command system. 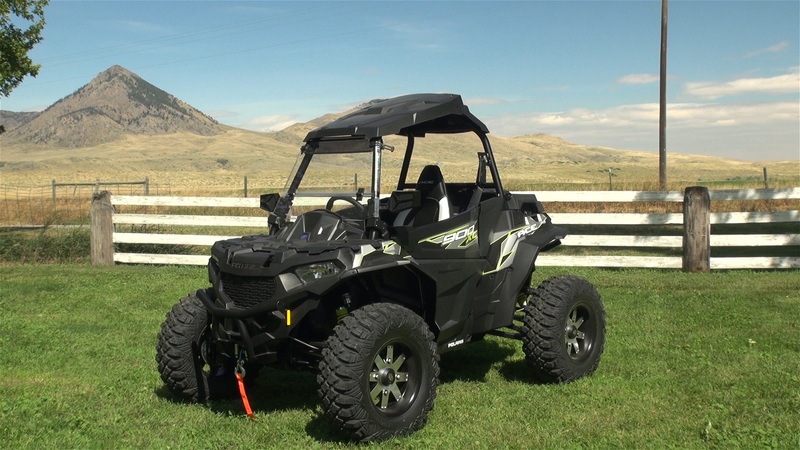 Ride Command comes standard in the Ride Command Edition RZR XP 1000 or as an add-on for other RZR models. It lets you view trail maps, see your friend’s locations, listen to AM/FM radio, connect with your cell phone, control your GoPro camera and more! CLICK HERE to learn more about Ride Command. Thanks to GoPro for the camera and versatile clamps that made our on-board video possible. 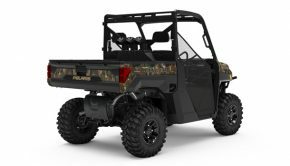 The 900 XC is powered by the fuel-injected, 875cc, ProStar engine that powered the RZR XP 900, but with one throttle body instead of two. It has four valves, and dual-overhead-cams per cylinder producing a claimed 78hp. 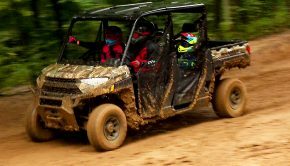 The 900 XC is powered by the fuel-injected, 875cc, ProStar engine that powered the RZR XP 900, but with one throttle body instead of two. It has four valves, and dual-overhead-cams per cylinder producing a claimed 78hp. A shift lever next to your right hip selects between the automatic CVT transmission’s high and low ranges, neutral, reverse, and park. The drive system can be switched between two-wheel-drive and Polaris’ High Performance All-Wheel-Drive system. Compared to their standard all-wheel drive, it’s claimed to engage the front wheels more quickly providing four-wheel-drive when the rear wheels begin to slip. Power output and delivery will serve a large audience well. Delivery is linear with no surprising hits, allowing for a mellow, easygoing experience. When it’s time to play hard, the engine responds well when you stomp the gas without being so abrupt as to easily get you into trouble. Power rolls on smoothly and adequately off the bottom, then keeps building through the RPM range. The car gets off the line in a hurry, is fun to power-slide out of turns, and delivers a power-to-weight ratio that makes getting airborne easy. While we didn’t tackle any large inclines with the machine, from what we felt, we suspect you’ll run out of traction before the engine runs out of power. Power output and delivery will serve a large audience well. When it’s time to play hard, the engine responds well when you stomp the gas without being so abrupt as to easily get you into trouble. With handling holding the car back in years past, we were most excited about the new chassis. Compared to the original chassis, the XC is 11” wider with a wingspan of 59”; its wheelbase is 6” longer at 67.5”; and ground clearance is up 3” to 13”. 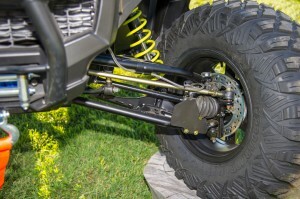 Part of the added ground clearance comes from the new dual A-Arm suspension at both ends. Boasting 12.3” of travel front and 12.6” rear, up 50% front and 33% back compared to the original Ace I. The shock package is well appointed with reservoir-equipped Walker Evans Needle Shocks found at all four corners. The needle shocks are said to reduce the harsh sensation of reaching the end of the travel. They feature spring preload and compression damping adjustment. Sway bars at both ends help control body roll in turns. Electric-power-steering comes standard. Walker Evans needle shocks are said to reduce the harsh sensation of reaching the end of the travel. 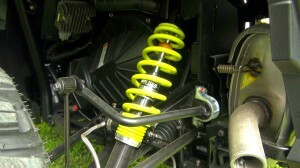 They feature spring preload and compression damping adjustment. The rest of the 900 XC’s added ground clearance comes from its larger 27” tires. 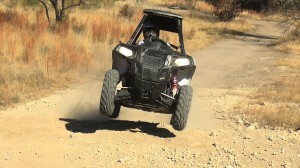 Polaris used premium quality GBC Dirt Commander Tires that come mounted on 12” cast aluminum wheels. 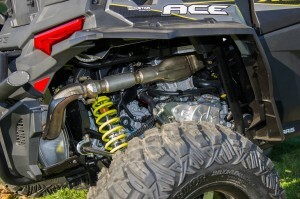 The handling and suspension of the new Ace have you thinking more about possibilities than limitations on the trail. Steering is nimble in the tight stuff and touch sensitive at high-speeds, although the dramatically improved stability seemed to make up for the high-speed nervousness. Steering was pretty accurate seeming best suited for tight to intermediately wide open spaces. Steering is nimble in the tight stuff and touch sensitive at high-speeds, although the dramatically improved stability seemed to make up for the high-speed nervousness. The added stability makes the XC far more entertaining to drive. Less experienced drivers should be able to relax more, while experienced pilots like our test driver, Allen Knowles, are treated to a much higher level of fun. In the somewhat silty Montana dirt, power-slides were totally possible. You feel much more confident pitching it sideways in the new Ace. Bumpy sidehills are also far less sketchy. During our brief encounter, the suspension’s action was what we have come to expect from Polaris. It was plush over small to intermediate size bumps both crawling along and at high speed. Plus it held up well to a few bigger hits. We were launching it and flat landing nose first from a few feet of air at lower speeds, which barely found the limits of the shocks. Landing from a properly shaped jump out on the trail, the car seemed to fly nicely and landed gently. 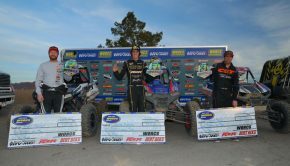 We would have loved some time to tune the shocks, although we were pretty happy with their performance during our initial drive. During our brief encounter, the suspension’s action was what we have come to expect from Polaris. It was plush over small to intermediate size bumps both crawling along and at high speed. Plus it held up well to a few bigger hits. Deemed XC, we could see this wide track, long-travel ACE really tearing up a course in the single-seat class at a GNCCs where the dirt commander tires would be right at home in the diverse conditions. The Ace is equipped with four-wheel hydraulic disc brakes that do a great job of scrubbing off speed. With no engine braking system, the car can coast through rough sections if desired, leaving the Ace completely dependent on its brakes to slow down. The Ace is equipped with four-wheel hydraulic disc brakes that do a great job of scrubbing off speed. We didn’t care for the brake pedals’ location on the right side due to the 1970s automobile style center hump that runs down the floorboard. It prevents two-foot driving. We like two-foot driving. Allen managed to stuff his 6’4” frame into the car without being overly cramped with plenty of room to shrink the cockpit down for shorter drivers. The 900 XC is said to boast 10% more legroom and a cockpit with 13% more entrance room. It has an adjustable seat and tilt steering. Allen managed to stuff his 6’4” frame into the car without being overly cramped with plenty of room to shrink the cockpit down for shorter drivers. Polaris’ ¼ doors are much nicer than door nets. The all-digital display provides all the info you would typically expect. With Bluetooth compatibility, you can also stay connected to your phone for missed calls, texts, and more. The rear cargo bed can hold 240 pounds. The combination front rack and storage box holds an additional 120 pounds and provides nearly 3 gallons of internal space. The rear cargo bed can hold 240 pounds. The combination front rack and storage box holds an additional 120 pounds and provides nearly 3 gallons of internal space. The lids turnstyle latches feel somewhat flimsy. Two, open in-dash storage trays are located in the cockpit. 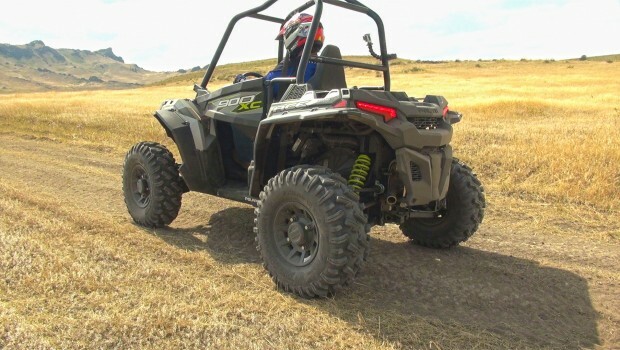 At only $2,000 less than the two-seat RZR S 900, its $12,999 asking price could be considered steep, although at only $1,000 to $3,000 more than most big-bore ride-on ATVs, it will certainly have some would be ride-on buyers doing a double take. 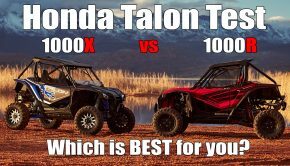 The biggest problem we could see with purchasing the new 900 XC is that based on recent trends, Polaris is far more likely to come out with a slightly more expensive 1000 XC version next year than a more affordable 570 XC, but those are the times we live in today. 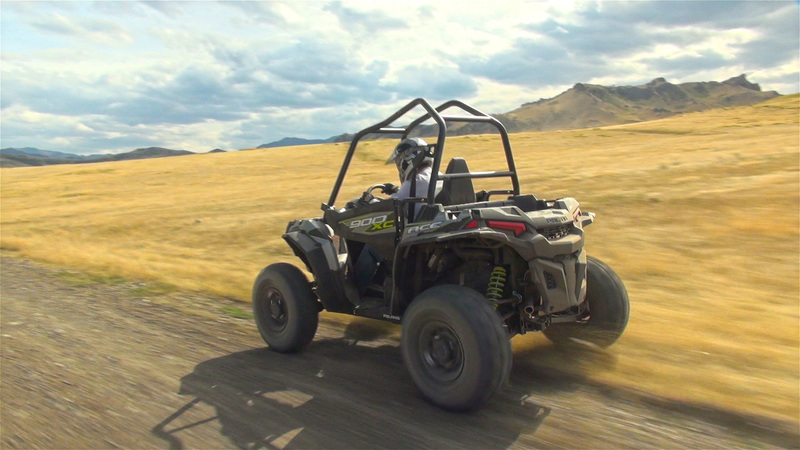 this car’s performance is leaps and bounds beyond any other single seat UTV on the market. With only one hour of driving time, it’s hard to explore the finer details of the machine. 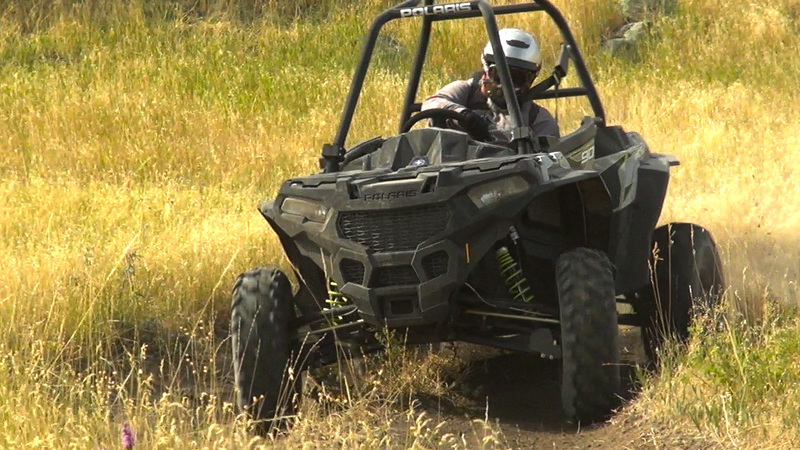 We can say for sure that this car’s performance is leaps and bounds beyond any other single seat UTV on the market. It’s a machine that even performance-minded, single-seat skeptics can enjoy driving, although a cautious-minded beginner could jump right in and go. Summary: With only one hour of driving time, it’s hard to explore the finer details of the machine. 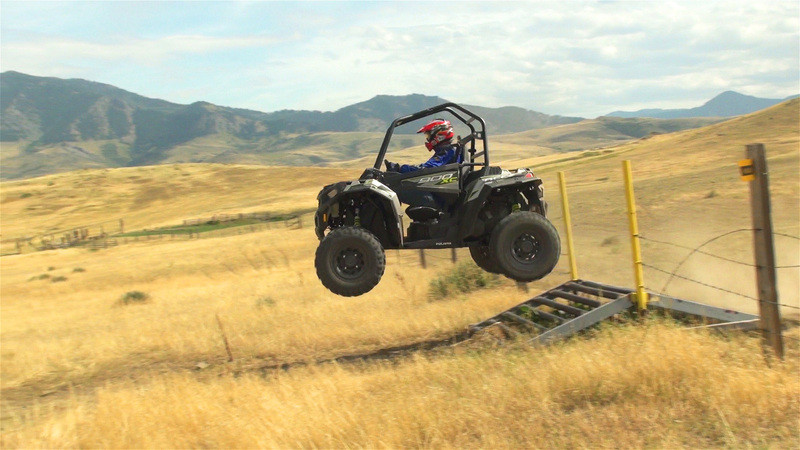 We can say for sure that this car’s performance is leaps and bounds beyond any other single seat UTV on the market. It’s a machine that even performance-minded, single-seat skeptics can enjoy driving, although a cautious-minded beginner could jump right in and go.